What can I say about François Truffaut? There are many scholarly books written about the Nouvelle Vague and its protagonists, Truffaut, Godard, Chabrol, Rohmer. There are books about Truffaut and books by Truffaut. No film fan should leave Truffaut’s book on Hitchcock unread, it gives such great insights into the minds of two masters. I won’t compete with any of the above, this rant is just about what Truffaut means to me. 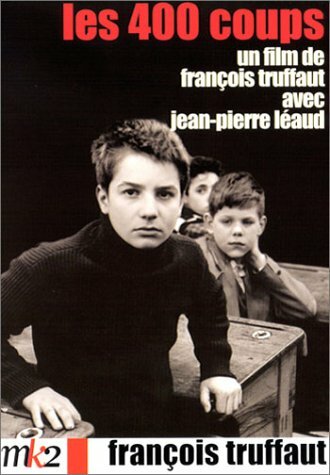 I remember seeing and being hugely moved by ‘Les Quatre Cents Coups’ (‘The 400 Blows’) when I was a kid. I didn’t think it was a fictional story, I thought it was some kind of magical documentary since Truffaut had captured being a young, angry lad so well. The confusion, the joy, the anguished isolation – they were all there. It shocked me. At the time, I didn’t even know who Truffaut was. I assumed he was the boy. It turned out I was half-right, since the film is partly autobiographical. But don’t think this a dreary, worthy film: there’s the sharpest humour here too, as when Antoine has to think of an excuse for skiving. I won’t spoil it but what he blurts out to the teacher always makes me laugh. Then, in my early twenties, I joined the dots. I saw a marvellous film called ‘L’Homme Qui Aimait Les Femmes’ (‘The Man Who Loved Women’). And I realised I knew the director’s name. So I searched out more films by him… ‘Jules Et Jim,’ ‘L’Enfant Sauvage,’ ‘La Peau Douce,’ ‘Fahrenheit 451.’ They were all brilliant! I was an addict. I had to read every book about him as well as watch every film. Others males my age were obsessed with Scorcese, Kubrick and Coppola or, later, Tarantino. For me, it was Truffaut. Always Truffaut. I’ve watched ‘Les Quatre Cents Coups’ many times. I’ve analysed the mise-en-scene, the angles, the acting. But it remains beautiful to me, even though I’ve peeked behind the curtain. Jean-Pierre Leaud, as the young tearaway Antoine Doinel, is always casually, effortlessly mesmerising. Leaud would go on to play the Doinel character through Truffaut’s entire cycle of Doinel films. Surely, this is the greatest series in cinema, more moving because Truffaut brings back the same actors as the same characters sometimes decades later. The last film, ‘L’Amour En Fuite,’ was released in 1979 so we get to see the grown-up (though not necessarily matured) Doinel as he continues to barrel through life. But that journey starts here, with young Antoine racing through the streets in that checked jacket. Apparently, tonight’s treat is the first in a short season of Truffaut films that BBC2 is showing. If you’ve never watched a Truffaut film, give them a go. I believe they are the most perfect films ever made. And now, the film is starting so I’m off!